Apple is now operating a top secret production laboratory in Longtan, Taiwan, formerly run by Qualcomm to develop a unique, low-power display technology known as IMOD, or Interferometric Modulator Display. According to a report by Tim Culpan for Bloomberg, Apple began operating the lab "as it aims to make products thinner, lighter, brighter and more energy-efficient." The report stated that lab employs at least 50 engineers and has recruited talent from display maker AU Optronics Corp. as well as Qualcomm, the former owner of the building. The lab now features no signage, but Bloomberg reported that the reception area features an Apple logo and an iMac "displaying Apple's standard visitor registration screen." 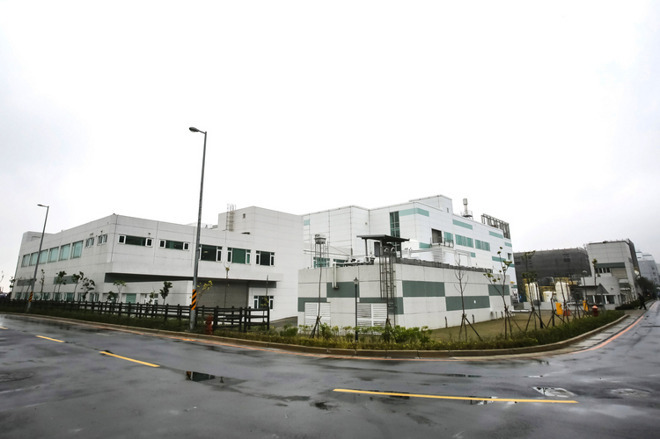 While the receptionist and security guards all refused to comment on the facility's ownership, government records show that the building is registered to Apple Taiwan, and a staff in the building were observed wearing Apple ID badges. Bloomberg speculated that Apple might want to "reduce reliance on the technology developed by suppliers such as Samsung Electronics Co., LG Display Co., Sharp Corp. and Japan Display Inc," and instead "develop the production processes in-house and outsource to smaller manufacturers such as Taiwan's AU Optronics or Innolux Corp."
Apple currently uses LCD screens in its Macs and iOS devices and an OLED display for Apple Watch. In passing, the report noted that the Apple lab was "where Qualcomm tried to develop to develop its own displays called Mirasol." Qualcomm Mirasol displays used an entirely different technology compared to conventional backlit LCDs (which create an image by electrically positioning liquid crystals and then shining visible light through it) or the more recent OLED (which creates an illuminated image from diodes, requiring no backlight and creating deeper blacks). 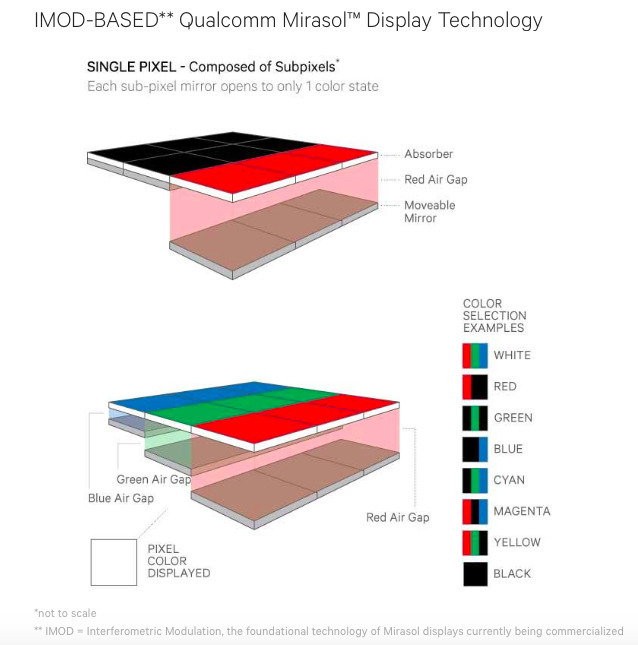 Qualcomm's IMOD technology uses an array of microscopic mirror-like elements that can reflect light of a specific color. Like OLED, it doesn't require a backlight. 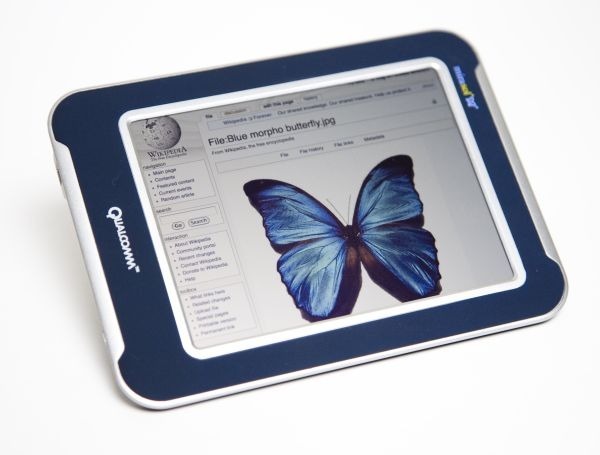 It also only uses energy when being being switched on or off; once an image is created, it requires no power to refresh or retain it, similar to E-Ink displays used in e-readers like the Kindle. 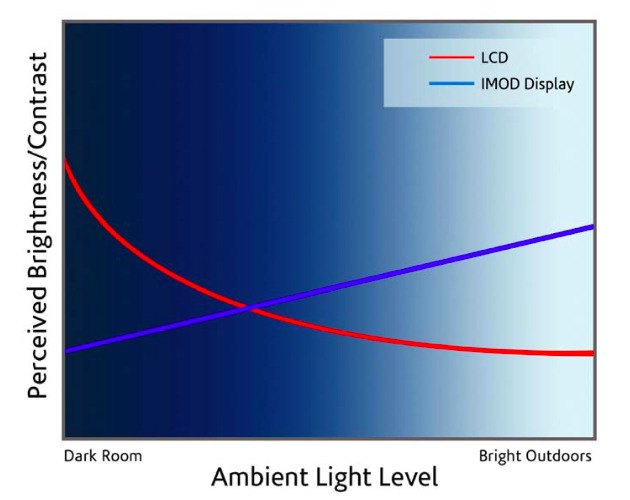 Also like E-Ink, IMOD technology maintains full visibility in direct sunlight, unlike LCDs and OLED. But rather than moving around dye like an E-Ink screen, IMOD uses tiny moving mirror-like elements, referred to as being a micro-electro-mechanical system, or MEMS (also known as a "micro-machine"). The downside to IMOD has historically been that it reproduces flat, unsaturated colors, a problem that may be possible to fix. CNN reported in 2007 that the technology was initially conceptualized by electrical engineer Mark Miles, inspired by Blue Morpho butterflies, which reflect light using nanoscale structures on their wings that cause incoming light waves to interfere with one another, reflecting only specific wavelengths, resulting in the appearance of an iridescent, brilliant color. Qualcomm acquired Iridigm, Miles' IMOD company, in 2004 for $170 million, hoping to create a market for the IMOD technology it branded Mirasol. However, Qualcomm hasn't been able to find a one. 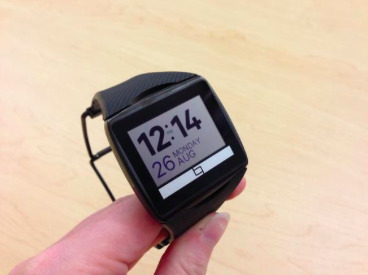 A decade later, the company introduced a Toq smartwatch with an IMOD screen, but the device flopped. 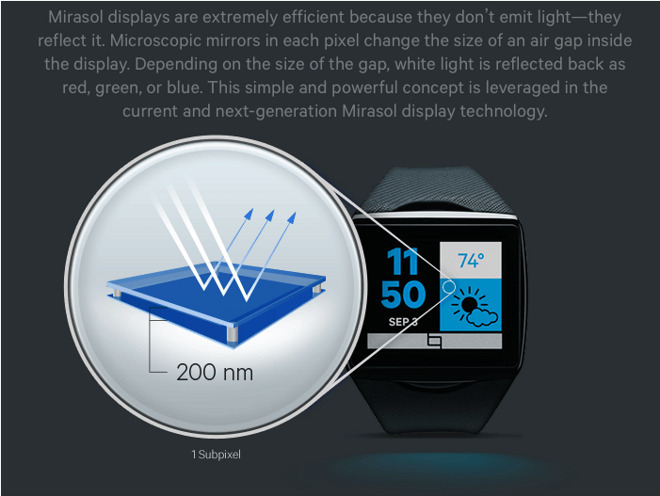 In reviewing the device, CNET noted that "Qualcomm's Mirasol screen on the Toq smartwatch looks brighter in sunlight than other display technology." This summer, Qualcomm took a $142 million charge on its Mirasol display business, after rumors from a year ago indicated the company's Qualcomm MEMS subsidiary would be selling off its Longtan Mirasol panel plant to Apple's primary chip fab TSMC. That indicates the possibility that Apple may have acquired more than just the facility, and instead has some interest in using Mirasol IMOD technology, which has long been regarded as a offering an advanced technological breakthrough in enabling a new class of low-power displays for use in phones, tablets or wearables. The reported Qualcomm hires may reinforce this idea. If Apple did take over Mirasol development from the financially strapped Qualcomm--which was forced to dump its less performant businesses under shareholder pressure--it may also have some relation to Apple's recent purchase of a small chip fab in San Jose, formerly used by Maxim Integrated Products to produce MEMS components. Maxim had been building MEMS-based sensors targeting the consumer market after acquiring SensorDynamics in 2011 for $164 million. Maxim announced a departure from the market earlier this year, reportedly after losing a contract to supply components to Samsung for use in a flagship smartphone. While information on IMOD technology from Qualcomm is now harder to find, the company once published a white paper that explained that "Qualcomm's Mirasol displays are produced using a process known as surface micro-machining, which is derived from the wafer scale roots of MEMS fabrication. "The name refers to the idea of building all of the structure and components of the MEMS device on the surface of the underlying substrate. In the case of Mirasol displays, these comprise an array of deposited metal and metal-oxide films which are lithographically patterned to produce a microscopic planar structure. The result is a monolithic electro-optic display which requires fewer process steps to build than the TFT array in a LCD." It also explained that Mirasol displays were relatively easy to produce from a typical FPD (Fabrication and Prototype Design) fab, noting that "the overarching manufacturing benefit of Mirasol display production is that the process was engineered to utilize infrastructure already in place in FPD fabs. All of the materials used for Mirasol display fabrication currently exist within the FPD palette and, in most cases, substitute materials may be utilized. The end result is a flexible and robust process that enables conversion, with minimal modification, of many FPD fabs into Mirasol display foundries, minimizing the time needed to bring IMOD technology to market." Over fiscal 2015, Apple said it acquired 15 companies, but the identity of at least 6 of these are not known. Regarding the identity of its acquisitions, Apple's chief executive Tim Cook has noted "some of which we'll try to keep quiet and some of which seems to be impossible to keep quiet." Given Apple's vast capital, it is now in a position to buy up any number of struggling, emerging technologies at a discount as the rest of the vendors in the smartphone, tablet, PC and wearable industries struggle to sell undifferentiated commodity Android products at low, low prices and their suppliers suffer upstream because of it. Both Qualcomm and Maxim are examples of firms directly impacted by a global collapse in smartphone profitability that has left Apple with 94 percent of the global earnings from smartphones. Texas Instruments and NVIDIA have both similarly given up on consumer smartphone processors, as Apple took over the high end of the market as it developed its own proprietary A-series SoC processors for use in its iOS devices.